Her use of the term “art” is especially telling in the approach that indexers use to their projects. Indexing is not a science, but rather an art, and indexers should be considered artists when applying their trade. As with the two previous volumes in this series, volume III of Index It Right!, provides insight into various aspects of the art. The reader can pick and choose which feature will give him/her the most help. Each chapter is written by an experienced indexer who shares his/her knowledge of a given topic. These experts have a variety of levels of indexing dating back as far as 1975 to a more recent 2010. Many of these experts have provided short “Expert Tips” relative to the chapter in question. Frances Lennie opens the discussion with “Indexing as Canvas, Musing On.” Her presentation of this chapter title is interesting and should not be lost on the indexer, as this is the way such a topic would appear in an index. Ms. Lennie talks about her love of paintings and she equates that love to the construction of a good index. She shares her insight in indexing with regard to painting styles, canvases, visual integrity, and the artist himself. The second and third chapters enter into discussions by Fred Leise and his personal history with taxonomies, and Chuck Knapp’s discussion of real-world Ecommerce Taxonomies. Mr. Leise explains the close relationship between indexes and taxonomies—both their similarities and their differences. He explains the design process and maintenance of ecommerce taxonomies, which gives a good transition to Mr. Knapp’s humorous introduction and discussion of discovering the art of taxonomy. The subject itself can be daunting, and Mr. Leise and Mr. Knapp both bring a clearer understanding to the topic. Glenda Browne and Mary Coe tackle the dicey activity of indexing ebooks, a timely topic for self-publishers who want to reach the greatest number of readers. They challenge the reader to understand ebook formats and the ebook reading devices they occupy. A particularly interesting aspect of this discussion is why ebooks need indexes when they are so easily searchable. Martin White, an indexer since 1982, provides insight into literary criticism—its philosophy, description, and evaluation. In an erudite discussion, Mr. White broaches the elements of author-title-character: and how they fit together as he approaches the concept of indexing. He also addresses indexing literary criticism in poetry, historical works, foreign language, and theoretical works. Indexing historical texts is also addressed by Connie Binder, with attention to time as a main topic and as a subtopic. Names are given substantial attention in her discussion on this topic as well as terminology and publisher’s guidelines. One of the deepest discussions covers scholarly books across cultures. This can include international, regional, and subcultures throughout the world. Celeste Newbrough focuses her attention primarily on this discipline and frequently encounters sociopolitical and/or historical trends as well as democratic values and economic competitiveness. She shares her experiences from these indexing projects to assist indexers at all levels to understand the treatment of scholarly books. Another specialty addressed is Medical and Science Indexing. Anne-Marie Downey tackles this topic by first addressing who the reader is, and in particular what that reader will be looking for in the index as he or she searches for answers. She goes into detail about the what, when, where, why, and how of creating an index for this discipline. In editing this book, Mrs. Zafran placed math right next door to science. Cynthia Landeen provides insight into how an indexer approaches a topic with such variety of specialties. She defines terms that will be used in an index and explains how they may be main topics or subtopics. Linda Dunn is one of those experienced indexers with over 30 years under her belt and she approaches periodical indexing by defining a periodical, the theory behind indexing a periodical and identifying what, exactly, is appropriate for an index. There are several “Expert Tips” included in this chapter to help the reader move through the process. This is on of the longest chapters in Index It Right!, and Ms. Dunn provides extensive references for the indexer interested in pursuing this discipline. Indexers are frequently challenged when indexing foreign names. Ms. Lai Heung Lam takes on this challenge as it relates to Chinese personal names. She explains how to decode these names; the correct use of tone marks, diacritic marks, and apostrophes; and the many variations that an indexer can encounter with Chinese names. Scott Smiley moves the reader back into the logic of indexing in his discussion on patterns. He defines the patterns that one will use when creating an index and the precise language often found in the various software programs used by indexers. This discussion of patterns found in software is very important, as it relates to the different software programs that are currently available to indexers and how to use them effectively. In this chapter, Mr. Smiley provides several tables that show differences between the three primary indexing software packages and how to decipher patterns in each. 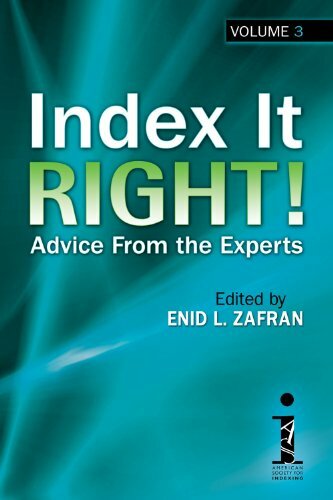 Ms. Zafran closes this volume of Index It Right!, with a discussion by Lucie Haskins on Teaching Indexing. Mrs. Haskins began indexing in 2000, and soon found an opportunity to teach an online course in indexing through the University of California-Berkeley. She shares her experiences in this chapter explaining the relationship with online students, assigning modules and reviewing assignments. She discusses the diversity of her students and how she motivates them to be successful. Her chapter is powerful in its discussion of establishing goals, establishing a business, marketing, and setbacks—an apt conclusion to an extremely thorough look at indexing. To reiterate Mrs. Zafran’s earlier comments: Indexing is an art. Not everyone will find it interesting; many will see it as a confusing or awkward process. Regardless, anyone who entertains the thought that this might be a path they would like to follow, Index It Right! (this and its previous volumes) should be investigated. For those who have already chosen this path, this is an interesting, well-written, and well-edited volume that should sit on their bookshelves and quickly become a dog-eared favorite. And a final note—the book has an excellent index created by Eve Morey Christiansen.